The Buy It Now option for DPW Auctions, if selected by the artist for an auction, is available until the first bid is placed. You check the Buy It Now option check box and enter a Buy It Now price when you create or edit your DPW Auction in your Art Tracking grid. 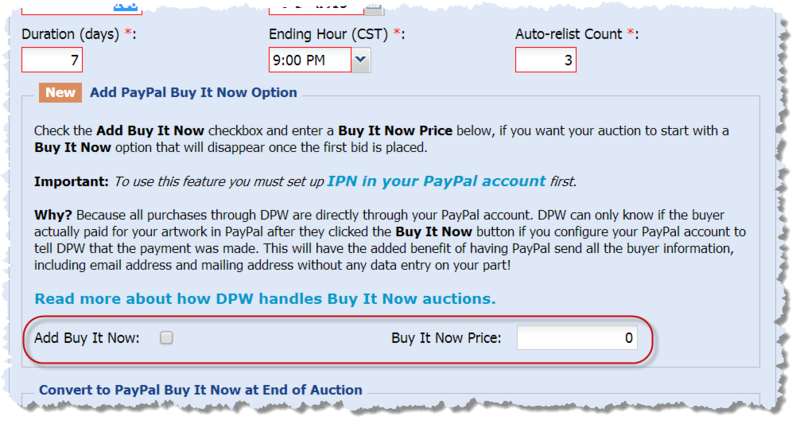 The DPW Auction dialog is available through the grid’s Upload Wizard or by clicking the little auction gavel icon in the left-most grid column. Please note that your Buy It Now price should always be greater than your auction’s starting bid. When your auction begins, your Buy It Now price and button will be available to buyers in addition to the usual bidding field and button. The Buy It Now option will remain available until the first bid is placed after which it will disappear. Posted - Thu, Oct 17, 2013 at 12:09 PM. This article has been viewed 8126 times.